Osamah Saeedi, M.D. is a Glaucoma Specialist at Baltimore Washington Eye Center. Dr. Saeedi earned his Medical Degree and completed and Ophthalmology Residency at the University of Texas-Southwestern Medical Center followed by a Fellowship in Glaucoma at the Wilmer Eye Institute, Johns Hopkins University. In addition, Dr. Saeedi completed a Master’s of Science Degree in Epidemiology and Clinical Research. He is the recipient of an National Institutes of Health (NIH) Career Development Award (K23) as well as receiving research funding from numerous other organizations including the American Glaucoma Society. His research focuses on finding novel imaging biomarkers for glaucoma, specifically looking at new techniques for assessing ocular blood flow. Dr. Saeedi perform laser treatments for glaucoma as well as glaucoma surgery including microinvasive glaucoma surgery (MIGS) using microscopic tubes, shunts and vales. 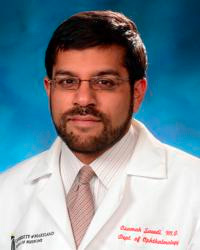 In addition to seeing glaucoma patients in need of medical, laser and surgical care at Baltimore Washington Eye Center, Dr. Saeedi an Associate Professor of Ophthalmology at the University of Maryland School of Medicine in Baltimore, MD, and an Adjunct Associate Professor of Bioengineering at the University of Maryland, College Park. at Baltimore Washington Eye Center in Glen Burnie and Gambrills, Maryland.